I couldn’t believe I, a 15-years old down-home girl from Sydney, was standing at Malé international airport about to begin my 10 day adventure surfing the photogenic breaks and staying onboard the luxurious Dream Catcher II. I was busting with excitement, my first all girls surf trip and it was going to be just like in the magazines, us girls hanging out and carving up the waves. 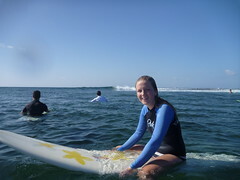 I had already met two of my surfer girls Toni, from Canberra and Jenna, from Umina. We were waiting by the board carousel, anxious to meet the other girls we started guessing who of the arriving travelers would be our companions on our journey sailing the Maldivian seas. A tall lady in red was one of our first guesses, until she walked off. Our second guess was a woman with a green hoodie passing through the immigration desk. We were right! She walked over to us and introduced herself as Jess, our very own kiwi girl from New Zealand to be joining us on the trip. Following behind came a beaming Kellie from Newcastle and an excited Fiona from Perth. Hands were shaken and names exchanged, we then collected our boards and proceeded outside to a hot Maldivian evening. 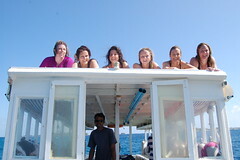 We were greeted by our Australian instructor called Charlie and our Maldivian boat captain, Jawah. The boys helped us lug our bags and boards onto the dhoni, which is a traditional Maldivian boat, and cruised across the harbour under the night sky with the ocean illuminated with boat lights. Even in the harbour the water was so clear, that you could see the fish and the reef at night. An aura of excitement filled the area and this ensured us all that we were all here and waiting the same thing; to have the time of our lives over the next ten days. On arrival at the Dream Catcher II we were all exhausted from our flights but determined to chuck our boards in and see what the Maldivian surf had for us. An incredible sunrise surf at the famous right hand surf reef called “Jail Break” had us all astounded by the natural beauty of our surroundings. We arrived back onto the boat and were in pure bliss, 5 star rooms, spacious entertainment areas, sunbathing deck and more. Buffet breakfasts on the back verandah was waiting for us, dolphin pods jumping pass, snorkeling in the clear aqua waters, visiting local islands and the endless sun baking in true paradise. So many pictures we saw and stories we read before our start to this trip didn’t lie and lived up to its promise, really! That’s the reason why our excitement as well after the first day not even lost a bit. Unfortunately our surfing adventure was coming to an end, it was now the morning of our final day. At breakfast we shared with each other of our incredible trip, including the waves we surfed, our best wipe ups, the party nights and the friendly people we had met. At this point in time little did we realize that a new adventure was to start?? Our three guides Jason, Charlie, Rod and our fellow surfer girl Jenna had to leave the trip early that morning leaving us with only half of our surfer family onboard. The excitement and taste of adventure overtook us again and we departed the Dream Catcher II early. Arrangements were made to take our bags and a dhoni boat was hired to take us around for the day. The five of us remaining girls set out early, the crew supplied us with packed lunches for the day, consisting of sandwiches and water. Energetic and determined to make our last day exciting we were eager for adventure and to see what the day would bring us. With adrenaline pumping through our veins we decided to self navigate our way to a more unknown break called Ninjas, we guided the dhoni drivers up the north Male atoll past the island till we stopped at what we thought and hoped was Ninjas. We were right and the surf was raging, a clean right hander breaker appeared before us. All ready to go and lathered in sunscreen we had no hesitation in throwing our boards in almost instantly and paddled through the current. As few king size sets came through, rattling those caught in the impact zone, we lost Toni to a wall of endless white wash. Seconds later, felt like minutes, we could see Toni for a short instant until she went missing in the ocean again. Blessedly after these second moments of fear about our friend we could recover her and knew that she wasn’t lost, but the day had yet begun. 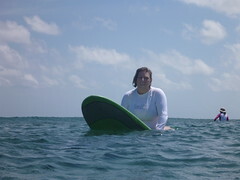 Toni managed to conquer and ride onto the reef in the shallows. Getting back out to us was not an option, the waves were not going to let her paddle back out. We all watched and waited as an unharmed Toni walked along the reef beach, as we later named ‘reef walking’. Luckily wearing her reef booties, Toni paddled back out against the harsh current to meet us back on the dhoni. After it was established that she was uninjured and still in good condition we devoured our sandwiches to fulfill the hunger in our stomachs and set our sails further north to fulfill the hunger in which we still had for the surf. Another self navigation by us girls was accompanied by a pod of jumping dolphins riding at the front of our boats and flying fish leaping out and over the water and saw that we arrive at Sultans, one of the breaks we had often visited over the past 9 days. The surf was crazy and at one of the biggest heights we’d endured through the week. Regardless of the size we all threw our boards in again, determined to conquer one last Maldivian surf. Out there we were joined by another group of surfers, three Aussies and an American. We shared our stories of our trip and they invited us to lunch at the resort they were staying at, Chaaya Island Dhonveli, which was on the other side of the break at Pasta Point. We took them up on their offer and arrived at Chaaya Island. We were guided to the dining area, in which each of us girls paid a US $ 30 for an all you can eat buffet overlooking a perfect wave set right in front of us at Pasta Point, truly amazing. Once we accomplished eating ‘all we could’ we bombed and splashed our way into the pool. Our time to leave came shortly after as the rain clouds rolled in overhead. The dhoni dropped us at the jetty, and we went to the taxi rank and asked for a lift. The five of us girls were not going to fit in their small styled cars with our boards. We were on the other side of the island, haven’t much time and didn’t know how we would get back to our hotel with all the stuff. Suddenly one of the workers said something in Maldivian to another of the workers then guided us around the back of the jetty area. We were greeted by a ute as he pointed and told us this is what we needed. The boards were packed into the back tray and followed by us girls. Receiving strange looks from the locals as we rode over the speed bumps and around corners in hysterics, we pulled up outside out small hotel inn with our suitcases awaiting us inside already. The five of us, and our bags, managed to squeeze into the one bedroom room and take turns to freshen up in the tiny bathroom before our sightseeing adventure to the main island, Male. The hotel shuttle bus dropped us to the jetty and we caught the spectacular sunset as the ferry went through the harbour. The island was filled with the hustle and bustle of motorbikes and cars cruising through the streets below the buildings. A local kindly offered to take us on a tour of the wharf side of the city, we passed a million more souvenir shops and the president’s office. Once back next to the wharf we separated from our guide and had one last snack at a café overlooking the city and harbour before our trip back to the airport. The ferry ride back was completely different, the sea was rocking us more and the darkness made it difficult to see anything except the city lights. We arrived back at the jetty and were lucky enough to catch the hotel shuttle bus again. Once we had collected our bags from the room and were waiting with our boards we were greeted by the airport shuttle service ready to take us to the airport for our flights home. While driving to the airport we each embraced the beauty of the place and were preparing to say goodbye to our times and each other. We arrived at the airport and spotted our guide Charlie, who was also flying out on that night. The driver pulled over as we called out to Charlie in hysterics, still buzzing from the excitement of our day. We told him all about the craziness and excitement of our incredible last day over a coffee before we our flight to Singapore was called and his to Kuala Lumpur. Catching one last glimpse of my surrounds through the darkness outside before the plane speed out along the runway I reminisced on the trip, how at home I had felt and the excitement that filled me when we first arrived, the thrill of surfing with dolphins, the beauty of the sea life I had snorkeled with, the adrenaline rush I got from riding those crazy waves at Sultans and Ninjas, the experiences I had, the people I had met and friendships made that would last a lifetime. When we landed at Singapore all us girls met up for one last time where we said our goodbyes and fought to keep back the tears as we had all become one big family over the past ten days. It was definitely a worthwhile trip with a life changing experience and one that I’ll never forget and hope I am lucky enough to one day return back to the tropical paradise that is the Maldives.